It's 60 something degrees outside! Holy cow! This morning I made my very first poached egg and it turned out pretty awesome. Our kitchen remodel is on its final stages to being nearer to completion. Can't wait to share photos! We are in season 2 of Breaking Bad and are (surprisingly, well for me at least) enjoying it v much. It's been pretty busy ever since we moved into our house and Kyle started school again. I look forward to the evenings after we have eaten dinner and done the dishes, walked the dogs around the neighborhood, and can finally CTFO and watch BB or AGT on our couch. We've been entertaining a lot more than we ever have in our time together and it has been so much fun. I made these enchiladas a few weeks ago and they were bomb! I knew I needed to remake them and share the recipe. My goal with this space is to start incorporating everyday recipes that we eat here. I usually think they are too simple to share but I think that is what most of y'all like based on what I gather from instagram comments and such: easy weeknight recipes! So, stay tuned! Although, now that it is nearer to Fall I can guarantee there will be lots of baked goods here too. Enchiladas are one of those things that you can feed me pretty much at any time and I will be so happy. 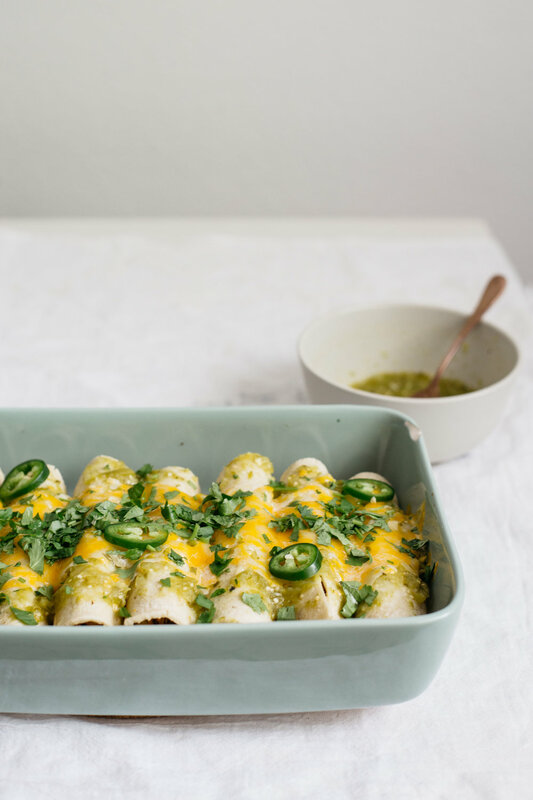 What I love about enchiladas is that they are so versatile. I love experimenting with new fillings, especially veggies. Black beans, squash, corn, mushrooms, zucchini, the list goes on. Even if you are a meat-enchilada-fan and think veggie filled enchiladas are boring, they are wrapped in a tortilla and doused with sauce and covered in cheese. So it's NEVER boring. These have chicken this time around, but I'm thinking of sharing a veggie filled one later on! Sometimes when I make enchiladas at home I cheat and use rotisserie chicken from the grocery store (gasp) and store bought enchilada sauce. But I felt like making an effort on this particular day, and I will say I can definitely taste the difference! This recipe uses hatch green chiles which is what was in abundance at the time I made these here, but if you are out of hatch green chiles feel free to sub in a few serrano chiles instead. The hatch green chiles can make it very spicy too, depending on the heat level. Most salsa verde chicken enchilada recipes have a bunch of sour cream to make it more creamy and cut a little bit of the heat out. This version is a little bit lightened up (although there is still cheese, obviously!). If you want to make it more creamy, add in 1/2 cup of sour cream to the salsa verde. 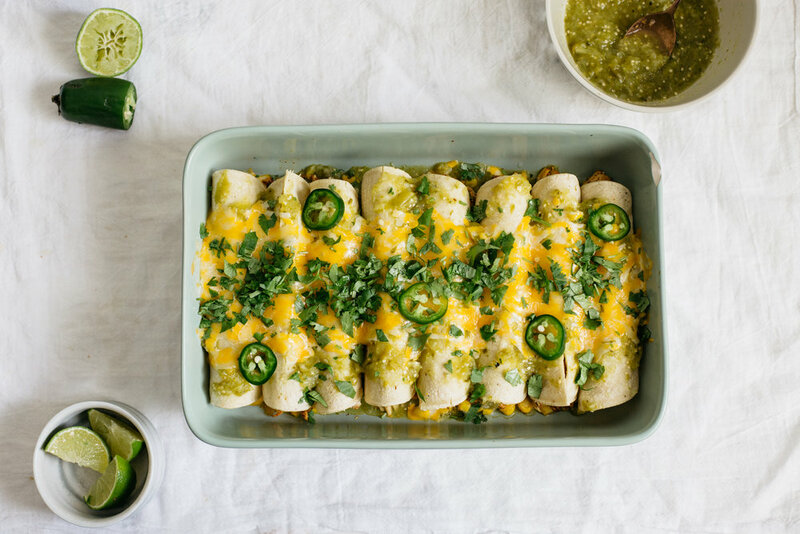 Few things are more comforting as the evenings get cooler than a tray of hot, cheesy enchiladas. Enchiladas go up there as one of my favorite foods. They are a staple in any good Texans (or non-Texans) diet! I hope you try these and if you do, tag me on instagram and let me know what you think! Preheat the oven to 400°F. Line a baking sheet with parchment paper. Sprinkle the chicken breasts with the oil, and season with the chili powder, ground cumin, paprika, and salt and pepper. Bake in the preheated oven for 20 minutes or until cooked through and juices run clear. Set aside to let cool slightly, and then shred the chicken with two forks. Change the oven temperature to a high broil. On a large baking sheet, arrange the chiles, tomatillos, jalapenos, and garlic cloves (skin on). Set on the top oven rack under the broiler and broil for 5-10 minutes or until tops of peppers are charred. Flip everything over and broil for another 5 minutes until charred. Remove baking sheet from the oven and pop out the garlic cloves. Using tongs, transfer the hatch green chiles in a plastic bag. Let steam for 1-2 minutes, and then carefully peel the outside skin off and discard. Cut off the tops and deseed the hatch green chiles, and then repeat the process for the jalapenos. 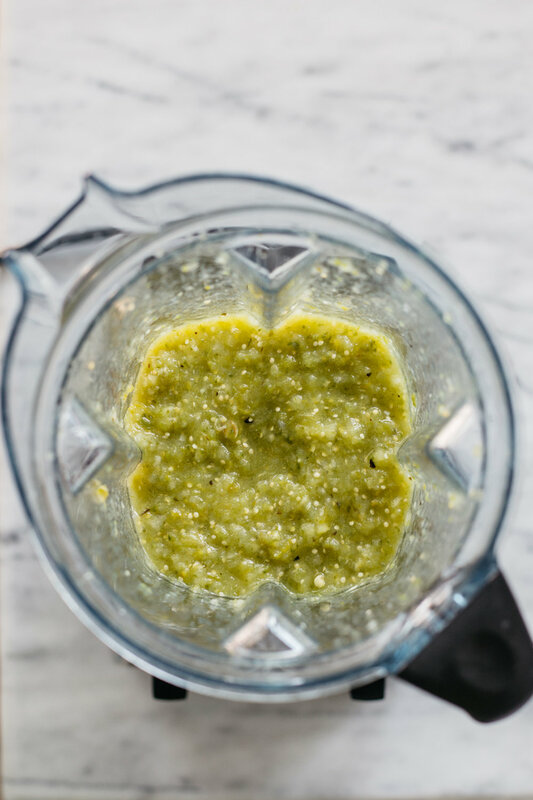 In a high speed blender or food processor, combine the hatch green chiles, jalapenos, tomatillos, garlic cloves, onion, cilantro, and lime juice. Blend until completely smooth. In a bowl, combine the shredded chicken, corn, and a few tablespoons of the salsa verde. Mix until combined. Using a large glass 9x13 baking dish, spoon about 1/2 cup of the salsa verde in the bottom of the pan. On a cutting board or clean surface, lay out tortillas and other fillings. Spoon 2-3 scoops of the chicken corn mixture in the center of the tortilla. Add a little bit of the shredded cheese. Roll up tightly and place seem side down in baking dish. Repeat until baking dish is full. Spoon the rest of the salsa verde on top of the enchiladas, and cover with the rest of the shredded cheese. Bake in the preheated oven for 15 minutes, or until cheese is melted and bubbly. Garnish with fresh cilantro and serve immediately!